When we see Tom Clancy’s name attached to a military shooter, we automatically start to think tactically. Stacking up to breach doors, using gadgets to spy on enemy patrols, and swiftly taking down threats as a team plays a huge role in Tom Clancy’s Ghost Recon: Future Soldier. But Ubisoft takes a small step towards the mainstream than say, the Rainbow Six series, and provides an accessible tactical shooter. You won’t be ordering teammates to take cover, flank enemies, or give you cover fire (the AI does all that itself), unless you’re coordinating with some co-op buddies through a headset. Future Soldier comes in three meaty chunks, all with a huge emphasis on playing well with others. The entire story campaign can be played with four other buddies, Guerrilla takes your entourage through horde gameplay, and cooperative emphasis in multiplayer is a beast all its own. The story takes place in the near future, in which soldiers have holographic HUDs, optical camo, and as many vision modes as any skull-polishing Predator. The (insubstantial) story leads to some real world locales, from Russia and the Middle East to snow covered mountains, deserts, and secret military installations. Though, for all the variety in the environments, the lack of any future elements conveys more generic sterility than a unique future world. It doesn’t go as far as putting flying cars into cities, but it certainly doesn’t push for visuals that look next-decade, which is a total letdown. Any technological advances outside our time-period are centered on the Ghost soldiers themselves, which shows in their gear and abilities. Played alone, the campaign places you as the point man on an AI controlled four-man Ghost squad. Running from cover to cover, taking pot shots and tossing grenades is made easy with the intuitive control scheme, and the detailed animations combined with the shaky-cam cover transitions immerse you in the action. The computer-guided squadmates usually pull their own weight as they drop spotted enemies and generally avoid being a pain to deal with. There were a few annoyances, like AI forcing a good thirty second-long wait for one team member to stack-up for a door breach or the character collision getting screwy in narrow passageways, but they were few enough not to hinder the flow too much. Ultimately, Future Soldier’s campaign is best played with a full four-player party. Providing covering fire, using class specific gadgets, and synchronized killing all come into play. It’s really gratifying to pull off coordinated enemy takedowns in stealth missions. Future Soldier makes this easy, with the “Sync Shot.” Players tag up to four enemies to which each member of the squad targets. 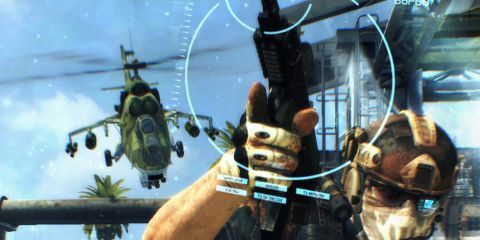 Once everyone is locked-on, the first person who shoots activates a short, slow motion window where the other players can squeeze off a kill shot. If it’s done right the four enemies drop simultaneously, leaving your group to go along their merry way. It is extremely satisfying. The campaign stays interesting by using a combination of gameplay styles mixed throughout. Stealthy “no alert” sections demand the most tactical planning, but there are also plenty of impressive setpieces that stoke that “videogame as action movie” feeling. So, you get a little bit of everything, and once you get through the eight-plus hour campaign, Future Soldier still has plenty to offer. Description Step into the near future as a squad of high-tech soldiers armed with optical camouflage and the world's top-tier weapons.